I ♥ Motherhood: The Adventures of Isla & Noah - Fab Farm Holiday At Coombe Mill! The Adventures of Isla & Noah - Fab Farm Holiday At Coombe Mill! This September we rather bravely went on our first family holiday as a foursome! Noah was 10 weeks old and Isla is 2 and we all went to Cornwall, which isn't the most fantastic of car journeys. As the day of departure approached I had a feeling of dread! How was it going to work? Four of us in the car with all our luggage for 7 hours, what was I thinking when I booked this holiday??!! As it turned out my kids were FANTASTIC! We stopped twice both ways at the times when Noah needed feeding. Obviously we were at his beck and call and so had to stop for as long as it took to change and feed him - an hour both times in case you're interested, therefore making a 5 hour journey take 7 hours. Even more surprising that Isla didn't go stir crazy in the car. She slept for about 1 hour of the journey. The rest of it she chatted and sang songs and looked out the window and did some drawing. So we arrived at our holiday destination and couldn't have been happier! We were staying at Coombe Mill, which is a farm in North Cornwall, very close to Padstow and Port Issac (Doc Martin is filmed here apparently). I knew that Isla would love it from the minute that I read about it. There is a feed run 6 days a week to feed the animals on the farm and this involves going on a tractor. She loved doing this and so did I. It was brilliant walking around the farm in the fresh air and Isla loved seeing the animals up close. We fed the animals together - and we took up our scraps to the greedy piggies - who as soon as they saw the tractor would run the length of the fence to greet the farmer and his bucket of food! We also saw the deer run majestically across the fields - such beautiful creatures! Isla's favourite part of the feed run was feeding the rabbits and collecting the eggs! Collecting eggs even resulted in her eating her first ever egg - how could she not eat a boiled egg collected fresh that morning? I was elated by this as she is a notoriously fussy eater, she had 2 eggs that week! What else did we do? We went swimming to a local pool when it was a rainy afternoon. We went to Padstow - didn't end up having Rick Stein fish and chips but we did have a cream tea AND a big ice-cream! We went to Newquay, had fish and chips and paddled on Fistral Beach. We went to Truro for a bit of a gander - this wasn't intentional we were heading for St Ives but realised we were a bit late to make the most of it and so stopped here instead. We also went to Polzeath beach to make sand castles and check out the hot surfers. Of course she didn't write this, she's only 2! And the time that we weren't gadding about North Cornwall was spent at the cottage which was well equipped for families. Mine and Tony's only gripe was that the bedroom was a little small for the four poster bed it had in it - the number of times we bumped our head on the overhead frame when getting up to feed Noah in the night was comical, but really that was the only thing and we are both exceptionally tall! We loved that the reception was stocked with some kids DVDs - Isla has developed an unhealthy love of 102 Dalmatians after a rainy Tuesday afternoon watching it twice! And if we hadn't of remembered our welly boots we would have found a pair our size to borrow. We also made use of the fab freezer with home cooked meals on our first night. Noah's first ever trip to the beach! Because we went in September after all the kids have gone back to school most families had children around Isla's age and babies. Everyone was so friendly and relaxed and sharing info on places they'd been that was good and also keeping an eye out for each others little ones and lending a swim nappy or two. 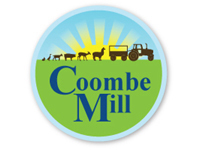 All in all we had an absolutely fabulous time at Coombe Mill, Isla especially loved it and has developed a love of goats! We'd definitely go back - especially knowing that there are now Wallabies on the farm! Lovely review from a lovely family:) Pleasure having you at Coombe Mill and we look forward to welcoming you back again in the future. Hope Isla is stil enjoying boiled eggs!